Tired of running out of POS paper at your restaurant, cafe, market, or other business? Restock with this paper roll tape! Great for printing customer receipts and easy-to-read sales records, this roll helps keep track of transactions for future reference of your business's finances. Its 2 1/4" narrow width and long 60' length is great for printing receipts from a wireless handheld printer at your produce stand or food truck. Plus, it notifies users when a refill is necessary with a warning signal on the paper. They fit perfectly and the price point is comparable to other websites. Very convenient to just order here with plus shipping option. I order all my POS paper here as well. So glad I found these. Half the price I was paying elsewhere. They also fit my credit card machines perfectly. We used to have to tear off about 20 feet of tape before inserting new roll. WE USE THIS FOR OUR CREDIT CARD MACHINE. WORKS GREAT,SAME AS FROM AN OFFICE STORE, BUT THE PRICE IS MUCH CHEAPER. THESE ARE SMALL ROLLS,BUT YOU GET 50 IN A CASE! We use this size (2 1/4x60’) for our VX520 card terminal. It’s a great value; especially since we go through so many rolls. Will reorder! An excellent product and at a very good price. I used to buy from Sams' club at $3 more per 25 roll box then I saw this deal and started ordering here along with my other supplies. Good savings. Good quality tape for my printer. Well packaged and very easy to use. I'm glad i can buy it here now rather than having to get it elsewhere. These rolls are great for credit card processing machines. They fit perfectly into the machine and have a good amount of paper before it needs to be changed out. These are great paper rolls are they are very reasonably priced compared to local food suppliers. They saved me a lot of money by purchasing them from the Webstaurant store! It is exactly what it says it is. Works exactly as it should and its packed in lots which is awesome! This is the best pricing on this take that ive been able to find anywhere. Placed my first order 2 days ago for thermal tape for our POS system. Being a Church run thrift store, we try to keep our costs as low as possible, we sell most of our clothes at 50 cents each so we don't make a lot. Not only was the price with shipping less than what we spend now for more, but it was here in 2 days!!!! This is our new go-to place for store supplies.... Bless all who work there for there fantastic service!!! Merry Christmas!! Mario Vento Manager Holy Spirit Thrift Store Mims, FL. This thermal tape is a great way to keep your POS machines selling items. It's a fantastic product that is much cheaper than office supply stores. Works great for our new CC machine. No need to pay high prices for paper. Why go through the CC company when they are so much cheaper here? Just be sure you put it in the correct way. It only prints on one side of paper. We use this thermal cash register paper in our cafe! We have not had any issues with it and the longer roll is nice to change out less often. Also very reasonably priced! I thought I had the best source for thermal paper, until I found what Webstaurant was selling them for! I use these for one of my printers that only take smaller rolls. I use this for a small credit card machine outside the pos. Its a phone line incase internet goes down. I have product for a over 9 months and the paper is still whitye not black. 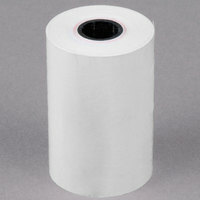 The 2 1/4 "x 60' thermal cash register POS paper roll tape has a great price. The paper is strong, tears off easily and never jams. This paper fits nicely and works well. I have ordered it 2 times now and it is very reasobabley priced here compared to other places. This is high quality thermal paper, we are using for our pos machine and also cash register, it fits perfectly. It's easy to install, also it's best price in webstaurant. Our go to for all of our small store sales. We replaced all of the office supply stores and online websites we used because this was the same quality and so much cheaper. This paper works great in our printer! Fast shipping and great price! Wish the paper was just a little bit thicker, so pens would write better and easier on. We use these thermal cash register rolls for our credit card processing. The price of this product through Webstaurant is better than that of the company we use for processing. We are so thankful Webstaurant has this product available! This is great price for these rolls of thermal paper. It works perfect credit card machines. Webstaurant beats everyone i could find on the internet. Some get close but don't beat them. Great competitive price on these rolls of paper. 50 rolls will last me a while. But when I do order again I will definitely order from here. The pricing on this product is great. It works in our credit card machines as well as any paper purchased at a higher price. Will reorder as needed. Quick ship and a good price for these. I just wish they would get better about combining boxes and keep the shipping costs down and I would order more often. Great value for this paper. I purchased it for my credit card machine for way less than the bank or other website. I will purchase this again. Price is great for this product. Search all the around. The paper roll come in a small box that makes it great to store away. Great pricing and fast delivery. works perfect for our credit card machine. recommend if you are looking for savings compare to other sites. Webstaurant is the place to shop. We use this thermal paper for our credit card machine. Works great and is the best price I can find online I would recommend ordering this product if it fits your machine. One of the only places I have found the 60' that fits my new credit card chip reader machine. I cannot believe how much cheaper I can get them here versus my local office store! Paper is priced reasonable. Imprint resists fading, even after sitting in a box in an extremely hot and damp kitchen. No smudging. One of the better papers I have used. 2 1/4'' X 60' thermal cash register POS paper roll tape - 50/Case is the best deal you can find. The paper works great and never had any issues with it. It's worth the price. I use it for my credit card terminal. Looked for this item on other sites, and it cost way to much. It was cheaper here and closest to the size I needed. Works great in our machine!